La Colombe is proud to announce co-founder Todd Carmichael will host a new tv show on Travel Channel, Dangerous Grounds, premiering Monday, November 5 at 10:00 p.m. following Anthony Bourdain’s No Reservations Series Finale. Check out sneak peek pictures from the show on Travel Channel’s website here. Eater National also did an article on these exciting news. How far would you go to get a good cup of coffee? 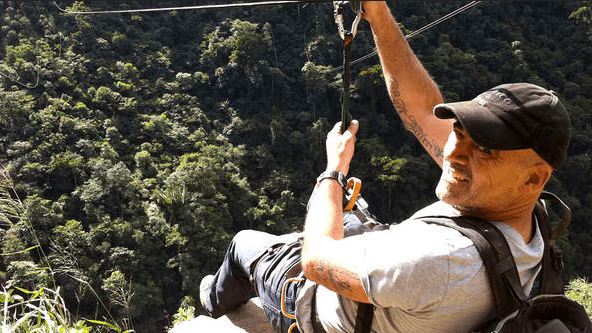 In Travel Channel’s new original series, Dangerous Grounds, premiering on Monday, November 5 at 10:00 p.m., ET/PT (moves to regular time slot on Tuesday, November 13 at 9:00 p.m., ET/PT), coffee magnate and adventurer Todd Carmichael traverses the globe, zip-lines on a makeshift cable thousands of feet in the air, and dodges machine gun-toting adversaries all on the hunt for rare strains of coffee beans in some of the most fascinating and unseen places in the world. Why? With nearly a billion people drinking coffee every day, coffee has become the second most-traded commodity behind oil, and most importantly to Carmichael, his livelihood depends on the success of finding the perfect hidden coffee bean! In 2008, Carmichael — a real-life Indiana Jones — set the still-standing world-record for the fastest unsupported trek to the South Pole: thirty-nine days, seven hours and forty-nine minutes. In addition to being an avid adventurer, he is also a successful businessman. His premium coffee company, La Colombe Torrefaction, is based in Philadelphia and supplies top coffee roasts to the best restaurants and gourmet outlets in America. Since Carmichael focuses on the rarest coffee beans, his exclusive blends are sought after by many of the world’s top chefs. Growing up on a farm in Washington, Carmichael can relate to the farmers he buys from throughout the world. Because of this, he bypasses the distributor that typically takes advantage of the farmers, and pays a fair price directly to the source.